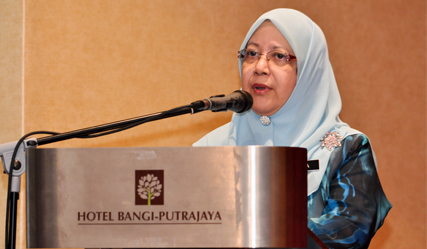 BANGI, 15 October 2014 – Networking and partnership are the two essential strategies in moving research and technology development to market place. Higher Education Director-General Professor Datuk Dr Asma Ismail said they become more relevant when the products developed are much needed by the communities governing the network and the partners. Prof Asma was addressing a dinner when opening the Malaysia-CLMV (Cambodia, Myanmar, Laos and Vietnam) Regional Cooperation in Technology Transfer and R&D Commercialisation workshop here today. The workshop was jointly organised by The National University of Malaysia’s Centre For Collaborative Innovation (UKM-PIK) and the relevant nations. Present at the dinner were ambassadors of Cambodia, Myanmar, Laos and Vietnam and the participants. She hoped the three-day workshop will discuss potential university-industry collaborations and cross-border entrepreneurial bio-business development, especially in transfer and commercialisation (TTC) of technologies developed by participating researchers of the five nations. She said Malaysia as an important ASEAN nation, will continue to strengthen its ties with fellow member states noting that the CLMV countries are interested in biotechnology, life sciences, animal vaccines and plant tissue culture. This workshop will among others examine best practices of TTC to be implemented by the academe and industry as well as how private and government agencies can enhance a supportive TTC ecosystem in terms of resources and infrastructure. Participants will have the opportunity to display their product information in the provided complimentary poster areas and to initiate collaboration and partnership during the business matching/networking sessions. To complement the technical and academic deliberation, they will also visit successful companies involved with bio-business. Among the companies involved were in agriculture research, livestock vaccines/diagnostics and plant tissue culture.